Hitman’s final elusive target (for season one, at least) is The Entertainer, also known as Mr Giggles, which leads me to assume he’ll be a clown. Hitman is great. In fact, it made our list of the best sandbox games on PC. Perhaps appropriately, he’ll appear in Marrakesh’s nighttime bonus mission, A House Built On Sand, which features an on-location movie shoot. The contract will be live for ten days starting at 13:00 BST (05:00 Pacific) tomorrow, July 14. Elusive Target #26 has two objectives: eliminate Mr Giggles, and acquire the Client List. 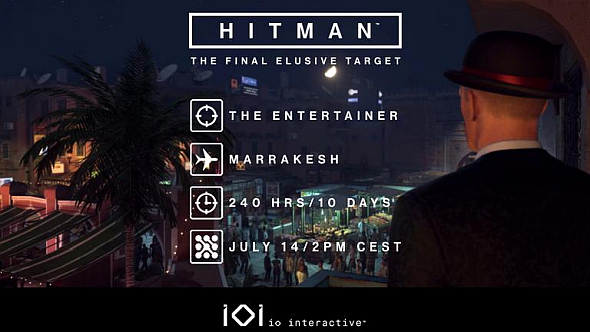 If this is the first elusive target you complete in Marrakesh, you’ll earn the summer suit with gloves, and the terminus suit if this is the first elusive target you complete with a silent assassin rating. As with all elusive targets, you can’t restart the mission once any targets have been eliminated or objectives completed. Here’s the announcement via developers Io Interactive. Roll on season two.